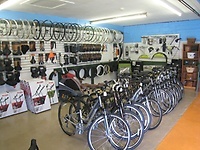 Brewster Bike is a full service bike shop located directly on the Cape Cod Rail Trail in the heart of Brewster. We are a proud dealer of Trek bicycles and rent high quality equipment for the whole family. We also carry Gary Fisher and Electra bicycles, and a full line of accessories.Our service department will repair or tune up your bikes and get you rolling again. We have ample parking and delivery service, too. So if you want the best rentals on the lower Cape along with great service and products, visit Brewster Bike!